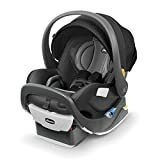 The best infant car seat will be easy to use and install in your vehicle while also offering you the flexibility that you and your child need. You can check to ensure your car seat meets US safety standards, offers up key features, and is compatible with a travel system you like, all at an affordable price. When looking for a new infant car seat, it can be intimidating to see all of the options and know that you can only pick just one. For many car seats, overlapping features and safety measures have gained in popularity and become somewhat standard. Higher priced car seats do not always guarantee quality, and our ratings reflect careful consideration of parent feedback and how the car seats worked for their children. Many car seats exceed US safety standards while also being fashionable and convenient to use. 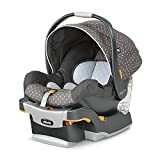 Car seats have also changed in recent years to come with the option of travel systems which frequently include a stroller and several different modes of use. These systems can be great for parents on the go, or for those looking to save some time and space in their vehicle. Before you purchase your car seat, looking into what features best fit your needs will help ensure that you are happy with your choice. Many parents are not happy with their car seats despite the many high-end features, and flexibility and ease of use are frequently to blame. 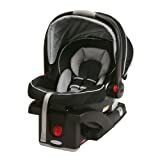 Finding the best infant car seat can seem overwhelming as there are a number of different choices available from different brands that are all well reviewed by customers. Fortunately, most infant car seats are designed with safety in mind, and we were able to gather data from several sites to assess the best features of each car seat. By gathering feedback from actual users, assessing the features of each car seat individually, and considering the overall reputation of the brand, were able to establish product ratings that are well rounded and encompass pivotal concerns from parents. 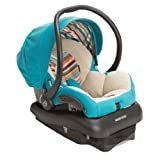 The best infant car seat is one that keeps your baby safe but is also easy to install and includes features that make your life as a parent easier. With a number of impressive options available, parents can now choose different colors, and pick which features and sizes of car seats best fit their vehicles. The Chicco Fit2 has a 2- stage base that can convert from a position suitable for infants to a toddler position. This flexibility in positions allows the car seat to be rear-facing which is ideal for the first two years. This seat also provides the ability to position your baby in a more upright posture while delivering greater adjustability and even extended leg room for infants who are over nine months in age. The seat connects to the base using the Super Cinch LATCH system and is also compatible with other Chicco strollers and their line of travel systems. The Chicco Fit2 is made in Italy and has a one-handed carry handle that is adjustable. The side of the base features a built-in level to make sure the seat is flat, and it weighs 20.5 pounds. It is suitable for young children weighing 4-35 pounds and up to 35” in height. The Chicco KeyFit is one of the most highly rated infant car seats in America and features a 5-point harness that can easily be adjusted using only one hand. It also has custom inserts that allow it to fit smaller babies and newborns from 4-11 pounds. It has the same leveling features as the Chicco Fit2 and also has the center pull adjustment for easy installation. This infant car seat weighs 17.5 pounds and can hold young children that weigh up to 30 pounds. This car seat also comes in more color options than the Chicco Fit2, although it doesn’t hold as much weight. However, it is still compatible with the Chicco line of travel systems and strollers. The Peg Perego Primo Viaggio is a higher end infant car seat that comes in the most significant number of color options typically offered. You can choose from different neutrals, a variety of bright colors, and even geometric shapes. This infant car seat is made in Italy and can hold young children between 4 and 35 pounds. The “dual stage cushion system” is versatile and makes this seat safe and comfortable for infants and toddlers alike. Installation is a breeze as the unit comes with a color-coded installation path that directs where the seatbelt should go in order to fasten the seat using the Peg Perego innovative system securely. This securing mechanism limits the rotation of the car seat in the event of an accident. This seat also features adjustable protection on both sides in case of impact, and there's no disassembly required to adjust even if the baby is currently in the seat. This seat is also compatible with the Primo Viaggio travel system that includes different strollers. The UPPABaby Mesa is another higher end car seat that can hold children weighing from 4-35 pounds. It comes in a variety of color options and weighs 25 pounds. This seat uses LATCH connectors that auto-retract, and a SMART Secure System that has a visual indicator to confirm when the seat is correctly installed and connected. The indicator will turn from red to green when the seat is installed correctly, and the adjustable harness has side impact protection that is integrated into the design. There is also a one-handed release option for when removing the seat, and the car seat is fully compatible with the UPPABaby travel system. Customers are big fans of the fabric used, but some mention that the warning labels on the inserts can get a bit warm in hotter weather. The material is reported to be super soft on baby's skin and is also free from toxic flame retardants. The Graco SnugRide is the best infant car seat in the ultralight category for those who are concerned about weight. This rear-facing seat is tested to ensure it meets or exceeds US safety standards and can also accommodate young children from 4-35 pounds. The SnugRide features foam that is incredibly effective at absorbing impact, and has the option to remove padding as your child transitions out of the newborn phase. This seat uses the popular LATCH system for easy installation, and also has a handy 5-point harness for the baby that is easy to use. The canopy on this seat can rotate for sun protection and makes riding with baby more comfortable. This seat comes in multiple color options suitable for both boys and girls and even comes in patterns. This seat also only weighs 7.5 pounds which makes it one of the lightest and safest available. The Britax car seat has two layers of internal padding to secure your young child between and also has an adjustable head protection measure. This seat is secured using the reliable LATCH method and has a belt lock off for extra security. 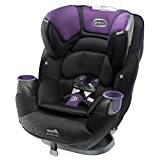 The design of this seat offers much more side protection than other models and also has multiple layers of padding that can be removed as your little one grows. The harness can be quickly adjusted to fit your child best, and the unit weighs in at 11.5 pounds. The Britax car seat is also compatible with their line of travel systems that include a stroller. If needed, you can purchase extra bases for your vehicles, and personalize your seat by choosing one of the many different color options. The Maxi-Cosi car seat mixes both function and fashion as a starter infant car seat suitable for young children between 5 and 22 pounds. Although you’ll need to buy another car seat sooner than with other options, it is compatible with their travel system, and you can use this option to customize what is best for your family. The Maxi-Cosi comes in a variety of bright colors and features some of the best side impact features available. This seat uses premium fabric and padding that properly snuggles your little one in a rear-facing position. This seat weighs in at 18.5 pounds and has a flip out visor and adjustable canopy for shielding baby from the sun. The ergonomic handle makes it comfortable to carry for parents who are on the go, and the 5-point harness is padded for security. The Evenflo SafeMax is part of a travel system that includes the car seat, base, and stroller base which allows for ultimate flexibility. This seat is suitable for young children between 4 and 35 pounds, and the stroller has a maximum weight of 50 pounds. The base of this car seat is unique because it has a rebound bar designed to prevent and dissipate forces during a crash. As part of the travel system, this car seat also can be used as part of 6 different modes including a reversible carriage option. This car seat has an easy to install base that has a 2-step belt-lock and also features four positions for reclining. Removing the car seat is easy with the press of a button, and it can then be secured in the stroller base with similar ease. Does this car seat meet US safety standards? Is it suitable for the weight and size of my child? Will this seat fit in my vehicle and be easily removable when needed? Whatever your budget you should be able to find a car seat that meets all of your needs and includes a variety of convenient features. Some parents feel more secure paying more for a car seat, but safety testing standards ensure that at any price point, your baby should be adequately protected. Higher end car seats frequently come in more color choices and have nicer fabric, but keep in mind that the underlying mechanisms are often the same as lower priced seats. Also, if you intend to buy a higher priced car seat, that may also mean you’ll need to purchase a more expensive travel system. Many car seats are also compatible with the travel systems offered from that brand, but they are frequently not compatible with the travel systems from other brands. Therefore, if you are interested in a travel system, you'll want to make sure that you like both the car seat and stroller that are compatible. Travel systems can be convenient particularly for new parents who want to take their car seat directly from the car and place it into a stroller base without having to disturb the baby. These systems can save valuable space and weight in your vehicle and simplify your life as a new parent. Car seats are designed to accommodate young children in a rear-facing position for up to 2 years or around 30-35 pounds. Some car seats come with premium fabric options or different color options that allow you to personalize your choice, but primarily the materials are the same. Most car seats will use the popular LATCH system which has been proven to be both easy and quick to use to install a car seat correctly. Other methods exist, some of which are color coded, and may prove more straightforward to use in some cases. The weight of your car seat may also vary along with the measurements, so it's a good idea to measure and make sure the seat will fit your vehicle. For most vehicles, this may not be a concern, but smaller cars may be limited in space and not allow you to fully recline the seat.